Computer networking is an integral and dynamically expanding component of information technology. To understand the evolving trends of networking, you need to be thorough with the basic concepts of computer networking. 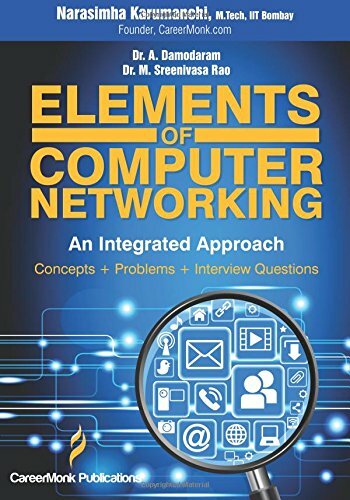 This book, Elements Of Computer Networking: An Integrated Approach (Concepts, Problems And Interview Questions) provides the resource for students of advanced graduate or undergraduate computer courses. The book places special emphasis on application-layer paradigms as well as application programming interfaces, thereby facilitating a real-time knowledge gaining process with protocols and networking concepts before going into protocol stack and more complex layers. Elements Of Computer Networking: An Integrated Approach (Concepts, Problems And Interview Questions) is a collaborative effort of authors Narasimha Karumanchi, Dr A Damodaran and Dr Sreenivasa Rao M. The book is comprised of 17 chapters, which include Transport Layer, Application Layer, Data Link Layer, Medium Access Control Sublayer, Physical Layer and Network Security. The authors have designed the book so that it is easily grasped by students. The book has been the popular choice for students of advanced networking courses owing to the solid reputation of the authors. Published by CareerMonk Publications in 2014, the book is available in paperback format. The book is designed in an easy to read format keeping students in mind. The book contains interview questions procured from real interviews of different software companies. It also contains hundreds of solved problems. Buy the book Elements of Computer Networking: An Integrated Approach (Concepts, Problems and Interview Questions) from Ideakart.com.